Seriously bored with your tired topknots and stale fishtails? Fashion Week is always the best time for shameless outfit browsing, but this season at fashion week, it was the hairstylists that served up some majorly lust-worthy looks. 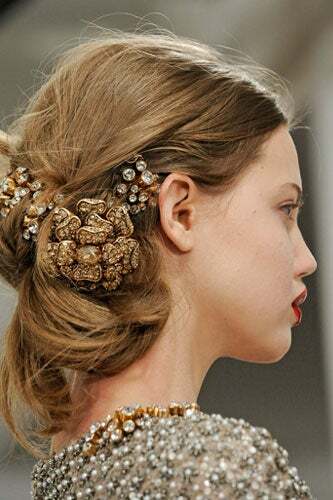 From Art Deco chignons at Jason Wu to rock’n’roll hair rosettes (yes, that’s a thing) at Rodarte to jewel-encrusted chignons at Oscar de la Renta, we saw hair that not only stunned on the fall runways, but also gave us ‘do-spiration that we can’t wait to try this second. Click through to see our selections for the most stand-out hairstyles you’ll want to wear right now — trust us, you’ll be pinning these for future reference! 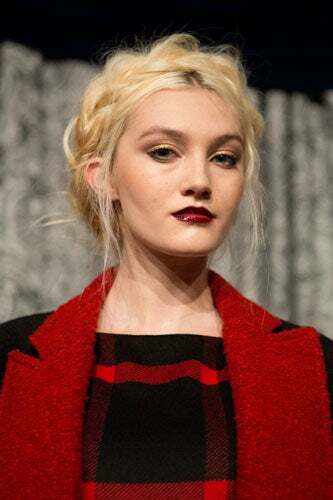 At Nanette Lepore, stylist James Pecis created a “girl from Mars” look with these spiky topknots. We love how the look is almost alien-chic — it’s a statement that’s cool, yet totally wearable. 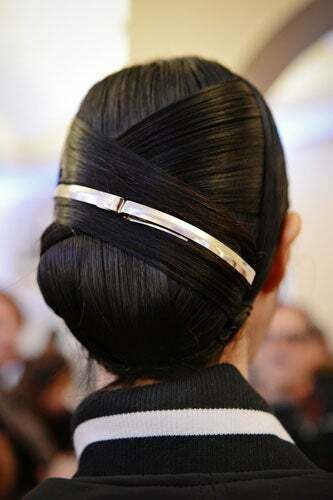 At first glance, this look could be a simple side chignon, but the close-up view shows that it’s anything but basic. Working with Kérastase Ciment Thermique to get that super-slick texture, stylist Odile Gilbert created this Art Deco-inspired look, wrapping sections of hair over each other. The two silver barrettes add even more slick, modern texture. 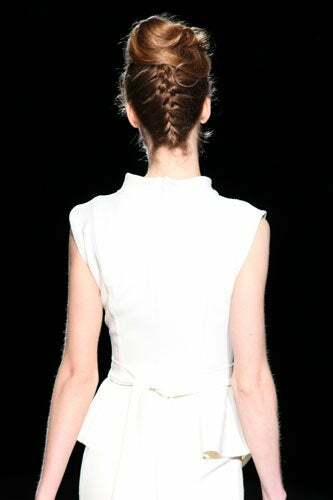 We love this fluffy, voluminous take on milkmaid braids, created by Antonio Corral Calero at the Alice + Olivia presentation. The dark, vampy lip combined with the devil-may-care texture takes the Heidi connotations out of this classic style. We’ve shown you how to create a French-braided topknot, but hairstylist Peter Gray took the look to the next level, curling and pinning the top of the hair for volume. The result: an incredibly modern, glamorous take on the french twist silhouette. At Zac Posen, hairstylist Guido created a “lightly frizzed effect” by using a small crimping iron, then brushing the hair out before winding into a chignon. The result: a seemingly polished style that’s classic, but not prim. To watch Orlando Pita create this incredible ’40s Gibson roll look backstage ( was like watching a sculptor at work on his masterpiece. Starting at the part, the hair was meticulously rolled back and then tucked in, to create a sleek yet romantic updo that perfectly accented Herrera’s dramatic collection. Hairstylist Odile Gilbert created “rocker princess texture” at Rodarte, braiding both sides of the hair and connecting them in the back to create a rosette bun. Some models wore barbed wire headbands atop this look — what could be more badass than that? We told you that natural texture would be in for spring, and as predicted, we saw this gorgeous girl wearing the heck out of her full waves at the Chloe Sevigny x Opening Ceremony presentation. Isn’t it great when the latest trend is to simply rock what you’ve got? We’d say it might be time for braids to take a back seat, because apparently twists are officially the new kids on the block, as seen backstage at Honor. While this look may appear super-intricate, it’s really just made up of a bunch of tight twists, pinned into a chignon shape. “Party in the back,” much? Of the four (yes, four) incredible hair looks at Oscar de la Renta, this messy, jewel-encrusted look has to be our favorite. This romantic, wispy, woven texture, accented with clusters of huge jewels, is opulence made casual enough for the street. Cool-girl favorite Rachel Comey accented the “punk-child-grown-up” vibe of her collection with soft yet totally badass hairstyles. We love how this girl’s pixie is a mix of skater kid and a gamine Audrey Hepburn. Totally unexpected, totally striking. To show off the luxe knits of Rag and Bone’s fall line, Guido used volumizing foam, followed by Powder Refresh to add a hint of grit to the hair before pulling it back into an alterna-chignon. The extremely low side part creates a new, downtown-edgy mood to an otherwise classic style. We went nuts for this modern faux-bob look at Tory Burch, created by hairstylist Eugene Souleiman. 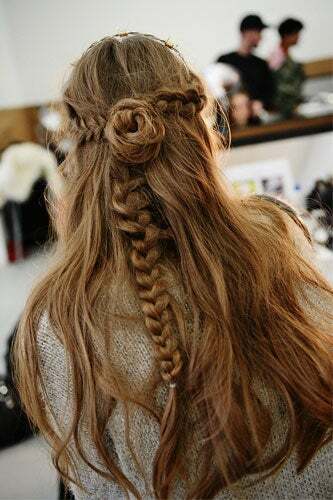 Rather than curling the hair first, the hair was smoothed back, rolled under, and then twisted into a side chignon. The result was totally unexpected yet drop-dead-gorgeous — this is one we’ll definitely be rocking this spring! At Alan Coban, the looks that are happening on the streets are just as important as the looks that on the runway. Here are a few of our favourite streetstye ‘do’s. These celebs have got the perfect Valentines Beauty looks happening. Which is your fav? The beauty look at Marc by Marc Jacobs was all about big, bouncy, beautiful curls. “The inspiration for this look was 1940-era woman — an uptown girl — but then we made it more fun, and thus more Marc by Marc. We didn’t want it to feel symmetrical or too perfect, so the backbrushing gives a teased effect; a little crazy,” says creative consultant, Guido Palau. Mod, playful, unexpected — so Marc. Here’s the Alan Coban guide to short shaved and androgynous. We pay tribute to all the lovely ladies who have been embracing pink this season. So many reasons to have fuchsia love! Here’s one for all those modern brides out there. Over the last few years we have been moving away from bridal hair that is too structured and lacks movement – to softer more ethereal looks. Stay tuned for more of these looks on our Facebook page.